The tiny border town of Redford Texas is located about four hours southeast from El Paso. On May 20, 1997 an 18-year old U.S. citizen of Mexicano heritage named Esequiel Hernández Jr. was shot dead by a group of Marines who had been deployed to intervene in the drug trafficking that was reportedly taking place in the area outside of Redford. Esequiel Hernández Jr. was killed by Marine Corporal Clementino Bañuelos, who fired his M-16 at Esequiel while the teenager was taking care of his goats in the back yard of his Redford home. At the time of the shooting the Marine unit was fully camouflaged; hidden from sight over 200 yards away from were Esequiel was tending to his animals. On August 14, 1997 a federal grand jury made up of two inspectors from the customs service, a sub-commander of the migra, and another ex-migra agent found Corporal Bañuelos “not guilty” of any crime, and he was cleared of any wrongdoing. No follow up investigation was ever made to hold any ranking military officials or political figures accountable for this event. 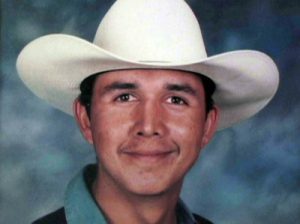 May 20, 2017 was the 20th anniversary of the killing of Esequiel Hernández Jr. Surely, as so often is the case, if this killing would take place today, opportunist politicians would waste no time in declaring Esequiel a “bad hombre”, while they celebrate Corporal Bañuelos as a hero. This entry was posted in Archived Posts, Barrio Youth News & Events, Border Related News & Events, History, History, Police & Migra. Bookmark the permalink.